phillipwserna – New Comma Baroque – Bold Historically Informed Performance. Period. https://www.wfmt.com/2018/09/06/new-comma-baroque/ On September 6, 2018, WFMT presented New Comma Baroque‘s program ‘The Twilight Kingdom‘ WFMT’s Impromptu hosted by Kerry Frumkin. Emmanuel Episcopal Church of La Grange‘s artists-in-residence New Comma Baroque return in a special program of rare gems from the twilight years of the viol: from Gottfried Mente and Christian Wilhelm Podbielski to the so-called ‘last gambist Carl Friedrich Abel, New Comma Baroque‘s Phillip Serna and Emily Katayama present a virtuosic exploration of late repertoire for the viola da gamba – including a newly-discovered work by Abel found in Poland in 2016! For more information on New Comma Baroque’s program, sample The Twilight Kingdom. For more information on WFMT’s Impromptu, visit https://www.wfmt.com/2018/09/06/new-comma-baroque/ or subscribe to WFMT’s Impromptu podcast. 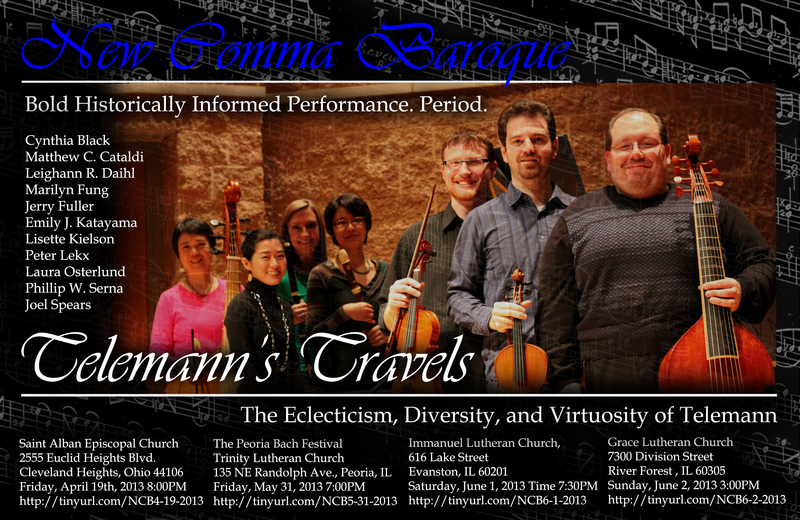 For more information on New Comma Baroque, follow us on Facebook at http://www.facebook.com/NewCommaBaroque/ & on Twitter at http://www.twitter.com/NewCommaBaroque. On June 15, 2018, WWFM’s Well-Tempered Baroque with Dr. Lewis Baratz presented New Comma Baroque performing the Chaconne en trio (1709) by Jacques Morel (c.1700-1749) and the Suite in a-minor for Viola da Gamba and Continuo (1759) by Johann Gottfried Mente (1698-1760). Airing weekly on Fridays on WWFM, the Classical Network, Well-Tempered Baroque with Dr. Lewis Baratz is an Early Music radio show designed to both educate and entertain, focusing each week on a particular topic and exploring the music and performers of music written from approximately 1600 to 1750. Other Early Music artists featured on this episode include violinist Kinga Augustyn, Mark Kramer with Ars Antiqua, and La Fiocco. 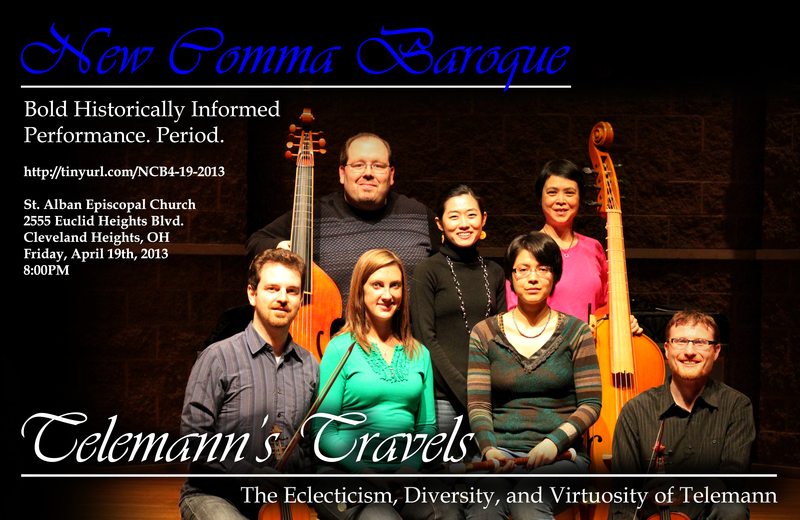 For more information on New Comma Baroque, visit http://www.newcommabaroque.org/. For more information on WWFM’s Well-Tempered Baroque with Dr. Lewis Baratz, visit http://wwfm.org/programs/well-tempered-baroque-dr-lewis-baratz. For more information on New Comma Baroque, follow us on Facebook at http://www.facebook.com/NewCommaBaroque/ & on Twitter at http://www.twitter.com/NewCommaBaroque. Located in 2014 by Thomas Fritzsch, a copy of Telemann’s self-published 1735 fantasias for viola da gamba survived near Hanover at Ledenburg Palace in the collection of Eleonore von Münster (née von Grothaus, 1734-1794). Dedicated to musical subscriber Mr. Pierre Chaunell (1703-1789) and published in a period when the viol was already out of fashion in Europe, Telemann’s unique fantasias encompass a plethora of forms – both old and new, inspired by the Polish and Moravian music of his early career, filled with techniques spanning fugal writing to elements of the rondo and concerto, straddling the High Baroque and the galant. As part of Early Music America‘s Early Music Month 2017, and Réseau Européen de Musique Ancienne/ European Early Music Network’s European Day of Early Music 2017, join New Comma Baroque’s Phillip Serna honoring the 250th anniversary of Telemann’s death! There’s Bach in the Subways, and now there’s TeleMannia! PHILLIP W. SERNA performs on double bass with numerous Midwest orchestras as well as on violas da gamba with period-instrument Early Music ensembles including Black Tulip, Burning River Baroque, New Comma Baroque, the Newberry Consort of Viols, the Spirit of Gambo – a Chicago Consort of Viols, and many others. He has appeared on WFMT Chicago 98.7FM, Wisconsin Public Radio WPR, Milwaukee Public Radio 98.7FM, and 91.9FM WUIS Public Radio and can be heard on film scores by Andrew Edwards, Scott Glasgow, and Kubilay Üner alongside CD releases from Clarion, Cedille, Soundbyte and Varèse Sarabande Records. As a soloist, Dr. Serna was the 1st American gambist to perform all of Telemann’s newly-discovered 1735 Viola da Gamba Fantasias in 2017, performing Johann Gottlieb Graun’s Concerto for Violin & Viola da Gamba in 2014, performing the U.S. premiere of Rudolph Dolmetsch’s Concertino for Viola da Gamba and Small Orchestra in 2012, and continuing to premiere concerti, perform recitals and championing a variety of new works for the viol. Phillip maintains a private teaching studio stretching across the greater Chicago-area where he teaches double bass and viola da gamba at Valparaiso University, double bass at North Central College, viola da gamba and viol consort at the Music Institute of Chicago, is assistant director and sponsor of viol consorts and Illinois’ first public-school period-instrument Baroque ensemble and viol consort at Adlai E. Stevenson High School. Committed to community engagement and educational outreach, Phillip is founder and music director of Viols in Our Schools, an Early Music program whose impact earned him Early Music America’s Outreach Award in 2010 and their Early Music Month prize for 2016. Phillip holds a Bachelor of Music degree from the San Francisco Conservatory of Music and Masters and Doctorate degrees from Northwestern University School of Music where he studied viola da gamba with Newberry Consort founder Mary Springfels. New Comma Baroque has gained a reputation for combining education and fun through their inventive programming. The ensemble has been praised for their “gusto” and “lively and intense performances” (John W. Barker, Isthmus, The Daily Page), playing across the Midwest, in addition to Boston and New York City. New Comma Baroque is a program of the Renovo Music Alliance, a 501(c)(3) non-profit performing arts organization. More information can be found at www.newcommabaroque.org and www.renovomusicalliance.org. As part of Early Music America‘s Early Music Month 2017, New Comma Baroque celebrates our 1st season as artists-in-residence at Emmanuel Episcopal Church with an exploration of music-making at the court of Frederick the Great with a virtuosic program featuring works by Carl Philipp Emanuel Bach alongside gems by Karl Heinrich Graun, Johann Christian Hertel, Ernst Christian Hesse and Johann Joachim Quantz. General admission tickets are $20, with special rates for seniors and students. On January 30, 2017, WFMT presented New Comma Baroque’s program ‘Telemann’s Travels: The Eclecticism, Diversity, and Virtuosity of Telemann‘ on Live from WFMT hosted by Kerry Frumkin. Telemann’s Travels is a delightful and delectable journey through vividly virtuosic solo & chamber music, filled with French, Italian, German and Polish flavors, encapsulating the travels of one of the 18th century’s most prolific composers: Georg Philipp Telemann. Telemann’s Travels features selections of some of the composer’s most well-known works for Baroque flute, Baroque violin, viola da gamba, and harpsichord, including music from Der getreue Music-Meister (Hamburg, 1728 -29), the Six quatuors a violon, flute, viole ou violoncello et basse continue (Hamburg, 1730, Paris, 1736), the Nouveaux quatuors en six suites a une flute traversiere, un violon, une basse de viole ou violoncelle et basse (Paris, 1738), the Essercizii Musici overo Dodesci Soli e Dodeci Trii à diversi stromenti (Hamburg, before 1740), and excerpts from the newly-discovered Fantasias for solo viol – not heard since the 1730s! For more information on New Comma Baroque’s program, sample Telemann’s Travels: The Eclecticism, Diversity, and Virtuosity of Telemann. For more information on Live from WFMT, visit http://blogs.wfmt.com/livefromwfmt/2017/01/30/new-comma-baroque-perform-telemann/. For more information on New Comma Baroque, follow us on Facebook at http://www.facebook.com/NewCommaBaroque/ & on Twitter at http://www.twitter.com/NewCommaBaroque. New Comma Baroque celebrates our first season as as artists-in-residence at Emmanuel Episcopal Church with a special program of Baroque holiday music by Bach, Corette, Buxtehude, Morel, Scarlatti, Ziani and so much more! Joining Leighann Daihl Ragusa (traverso), Phillip W. Serna (viola da gamba), and Emily Jane Katayama (harpsichord) are guests Amy Bearden (alto) of the Marion Consort and Katherine Shuldiner (viola da gamba). 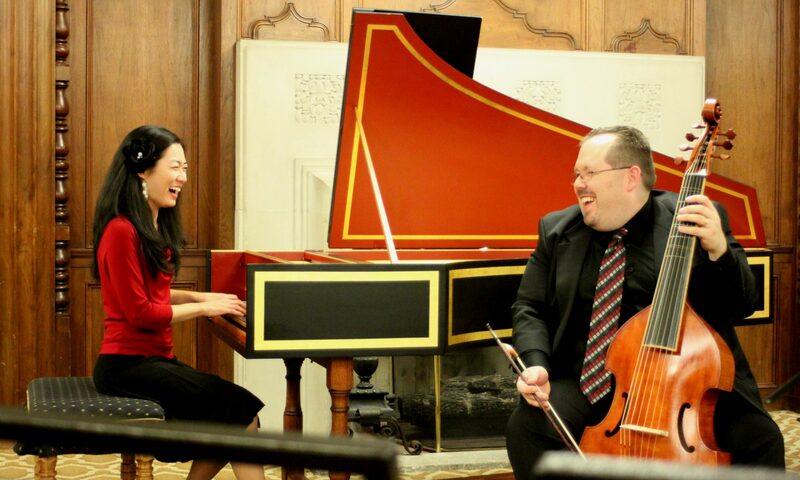 New Comma Baroque’s Winter Revelry is not to be missed! New Comma Baroque, the Chicago-based early music ensemble, is honored to announce its residency at Emmanuel Episcopal Church in La Grange. The partnership signifies the ensemble’s dedication to bringing music directly into the communities, as well as making historically informed performance accessible to audiences. Respighi’s Ancient Airs and Dances, Suite II. Christian Hertel, and Johann Joachim Quantz. For all of New Comma Baroque‘s concerts and other events, please visit www.newcommabaroque.org/concerts. On June 12th, 2013, WUIS Springfield released Karl Scroggin’s May 30th preview performance of New Comma Baroque’s Peoria Bach Festival program ‘Telemann’s Travels: The Eclecticism, Diversity, and Virtuosity of Telemann‘ via iTunes. This performance includes Telemann’s Quartet No.2 in a-minor from Nouveaux quatuors en six suites a une flute traversiere, un violon, une basse de viole ou violoncelle et basse (Paris, 1738), the delightful “Gulliver’s Travels” Suite for Two Violins, the Concerto No.2 in D-Major, TWV 43:D1 from Six quatuors a violon, flute, viole ou violoncello et basse continue (Hamburg, 1730, Paris 1736), the Fantasie in C-Major for Harpsichord, TWV 33:14, the Fantasia No.7 in D-Major for Flute without Bass, TWV 40:2-13 and the Concerto No.2 in D-Major, TWV 43:D1 from Six quatuors a violon, flute, viole ou violoncello et basse continue (Hamburg, 1730, Paris, 1736). For more information on New Comma Baroque’s program, sample Telemann’s Travels: The Eclecticism, Diversity, and Virtuosity of Telemann. For more information about WUIS Springfield, please visit http://www.wuis.org/. March 15, 2013 (Chicago, IL): New Comma Baroque, joined by a variety of guest artists, celebrates and explores the music of Telemann in an exciting, diverse, dynamic and virtuosic program, including the delightful “Gulliver’s Travels” Suite for Two Violins, the Concerto in a-minor for Viola da Gamba, Recorder, Strings & Continuo, TWV52:a1, the Concerto No.2 in D-Major, TWV 43:D1 from Six quatuors a violon, flute, viole ou violoncello et basse continue (Paris, 1736), the Quartet No.2 in a-minor from Nouveaux quatuors en six suites a une flute traversiere, un violon, une basse de viole ou violoncelle et basse (Paris, 1738), the Concerto in e-minor for Recorder, Baroque Flute, Strings & Continuo TWV52:e1, and much more! New Comma Baroque: Matthew C. Cataldi, Baroque violin, Leighann R. Daihl, Baroque flute, Phillip W. Serna, bass viol & Emily J. Katayama, harpsichord joined by guest artists Cynthia Black, Baroque violin (for April 19th program) Jerry Fuller, violone (for June 1st program), Marilyn Fung, violone (for April 19th program), Peter Lekx, Baroque violin & viola, Laura Osterlund, recorder (for the April 19th, June 1st & 2nd programs), Lisette Kielson, recorder (for the May 31st program) & Joel Spears (June 1st & 2nd programs). About New Comma Baroque: Dedicated to re-engaging modern audiences in historically informed performance, the Chicago-based ensemble New Comma Baroque features violinist Matthew C. Cataldi, flutist Leighann R. Daihl, gambist Phillip W. Serna, harpsichordist Emily J. Katayama and a variety of other collaborators celebrating cultural diversity through our rich musical heritage in the concert hall and beyond. Advocating a strong sense of cultural context as well as community and educational outreach, New Comma Baroque works in close conjunction with Illinois’ first period-instrument public school Baroque orchestra at Adlai E. Stevenson High School in Lincolnshire, IL as well as other programs. Please join us in a vibrant and new way of experiencing Baroque music. New Comma Baroque is a program of the Renovo String Orchestra, a 501(c)(3) non-profit performing arts organization under the State of Illinois. 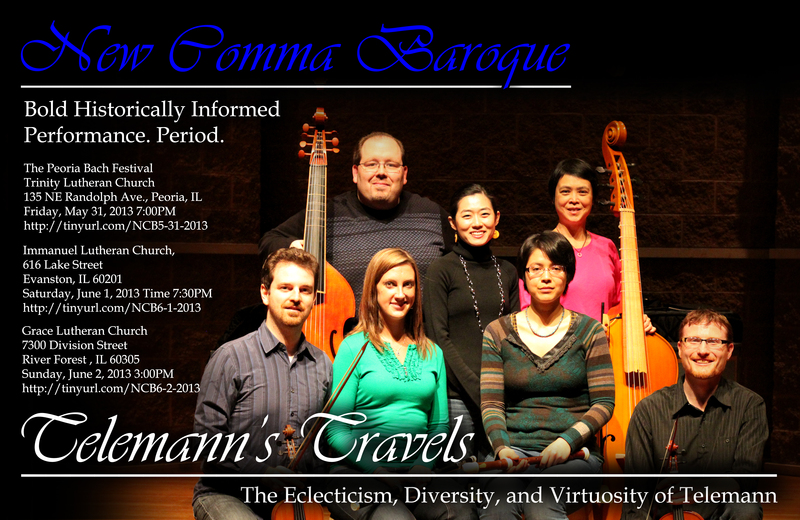 For more information on this and other concerts, please visit http://www.newcommabaroque.org/. New Comma Baroque: Bold Historically Informed Performance. Period. On March 4th, 2013, WUIS Springfield released Karl Scroggin’s November 5, 2012 interview and performance with New Comma Baroque member Dr. Phillip W. Serna, entitled “Phillip Serna and the Viola Da Gamba” recorded in WUIS’ Suggs Performance Studio. To read the complete article or listen to Karl Scroggin’s interview and performance by Phillip W. Serna, please click here. For more information about WUIS Springfield, visit http://www.wuis.org/. On December 26, 2012, New Comma Baroque members Matthew Cataldi, Phillip W. Serna & Emily J. Morlan joined Classical Revolution Chicago for their Bachxing Day Show at Gallery Cabaret performing music for viol & harpsichord, Baroque violin, viol & harpsichord and for viol & voice. For more information about Classical Revolution Chicago, visit http://www.classicalrevolutionchicago.org/. For information about the Gallery Caberet, visit http://www.gallerycabaret.com/. For up-to-date information on this and other programs, please visit http://www.newcommabaroque.org/. On September 16, 2012, Guest Artists Melanie and Russell Bookout joined New Comma Baroque for their program of French Baroque music entitled “Tous les Matins du Monde: All the Mornings of the World” at Valparaiso University. For a gallery of photos from the Valparaiso University performance, please click here. 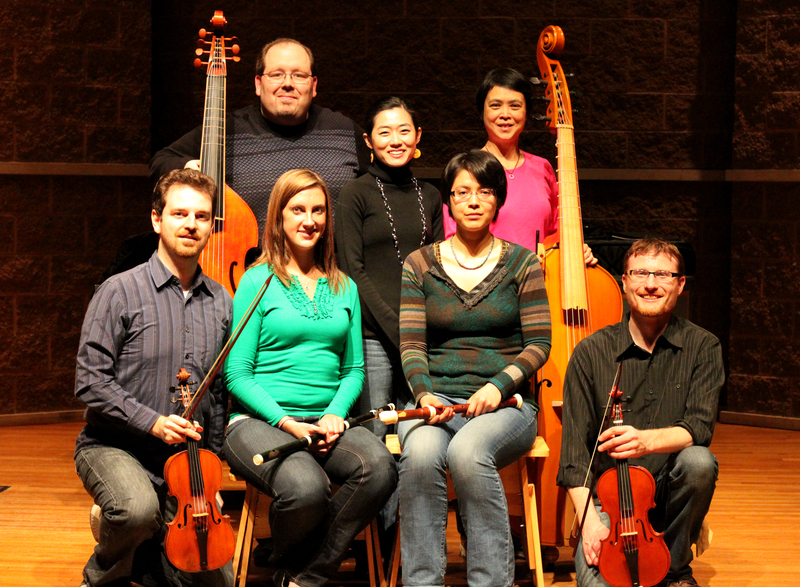 For a gallery of photos from the viols rehearsal at Valparaiso University, please click here. For information about Valparaiso University’s Music Program and Concerts, visit http://www.valpo.edu/music/. On September 14, 2012, New Comma Baroque was featured in Valparaiso University’s the Torch in a piece entitled “‘Baroque’ Puts New Spin on Classics.” covering their September program at the Valparaiso University Center for the Arts with guest artists Melanie and Russell Bookout performing on viols and lute. “Imagine the sweet sounds of the viol playing French music from the 17th century. To read the complete article from Valparaiso University’s the Torch, please click here. For more information about Valparaiso University’s The Torch, visit http://www.valpotorch.com/. For information about Valparaiso University’s Music Program and Concerts, visit http://www.valpo.edu/music/. On September 10, 2012, lutanist Joel Spears joined New Comma Baroque for an educational residency at Adlai E. Stevnson High School. Co-funded by the Chicago Federation of Musicians’ “Music in the Schools” program, New Comma Baroque’s classes included demonstrations on harpsichord, Baroque violin, and viols for the orchestra classes focusing on issues of instrument construction, technique, and performance practice. Gambist Phillip Serna was joined by Chicago-area lutanist Joel Spears, as guest artists in the guitar classes in the afternoon, performing medieval music for lute and vielle, viol and theorbo, as well as vihuela and German lute. Later that evening New comma Baroque presented a community concert of French Baroque music entitled “Tous les Matins du Monde: All the Mornings of the World” featuring Marais’s Sonnerie, excerpts from his Pièces de Viole from Book I & Book IV, as well as pieces from his Pièces en trio, and François Couperin’s Les Nations. For a gallery of photos from the day-long residency at Adlai E. Stevenson High School, please click here. For a gallery of photos from the concert at Adlai E. Stevenson High School, please click here. For information about Adlai E. Stevenson High School, director Enrique Vilaseco & their Period Instrument Baroque Ensemble, visit http://www.d125.org/clubs_and_activities/baroque_ensemble.aspx. 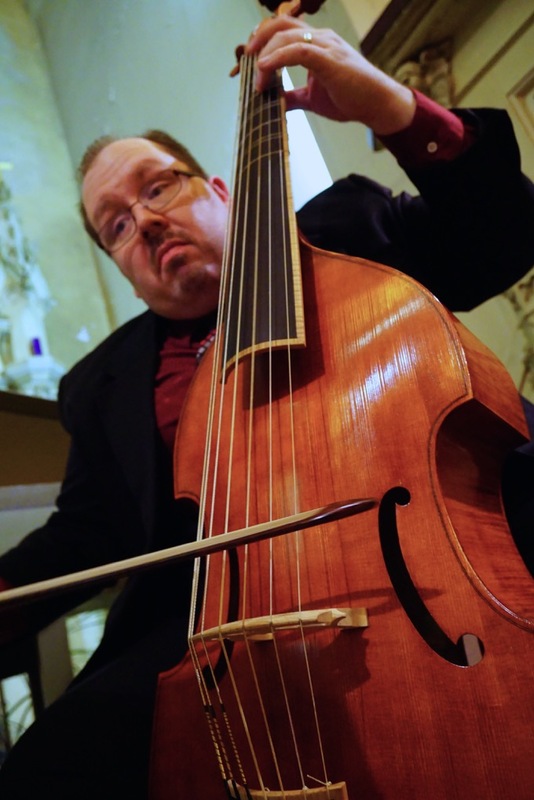 On August 4, 2012, New Comma Baroque member Phillip W. Serna was featured as part of Jeff Lunden’s piece “Gathering Of The Viols: The 50th Annual Viola Da Gamba Conclave” covering the 50th Conclave of the Viola da Gamba Society of America. On September 10th, Adlai E. Stevenson High School will host New Comma Baroque, a period-instrument ensemble featuring Baroque violinist Matthew C. Cataldi, harpsichordist Emily Morlan, and gambist Phillip Serna, for a day-long residency. This residency will include performance demonstrations for the orchestra classes focused on violin, viol & harpsichord, with lutanist Joel Spears joining Phillip Serna working with the guitar classes, culminating in a community concert of French Baroque music with guest-artist Leighann Daihl joining the ensemble on Baroque flute. New Comma Baroque announces our concerts for the fall 2012 season filled with collaboration, virtuosity and excitement. New Comma Baroque, with guest Leighann Daihl, celebrates music of the French Baroque in a concert called “Tous les Matins du Monde” (All the Mornings of the World), inspired by the 1991 film of the same name. This program features French Baroque masterpieces and virtuoso showpieces including works by Marin Marais, Jacques Champion de Chambonnières, Jean-Marie Leclair & François Couperin.